Comfortable Cows = Higher Milk Production. Tips for keeping your cows comfy! Milk production has many factors for success. 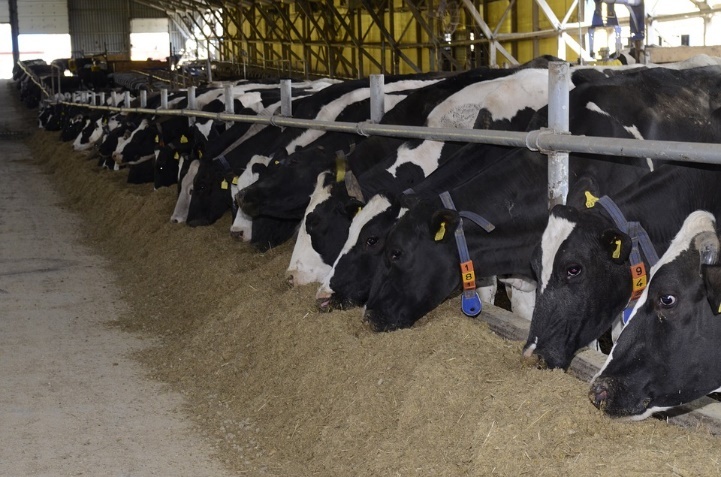 Dairy cows need to be consuming not just enough feed, but enough of the proper feed rations (please consult a nutritionist for a proper dairy feed ration). Clean water needs to be readily available for the cows 24/7. Once those items are crossed off the list, cow comfort is next. Cow comfort is very important to optimal milk production. Cow comfort includes (but is not limited to): making sure cows have clean bedding areas, proper bedding material, ample rest between milking so they’re not constantly waiting to be milked, and a regular schedule so their bags don’t overfill. 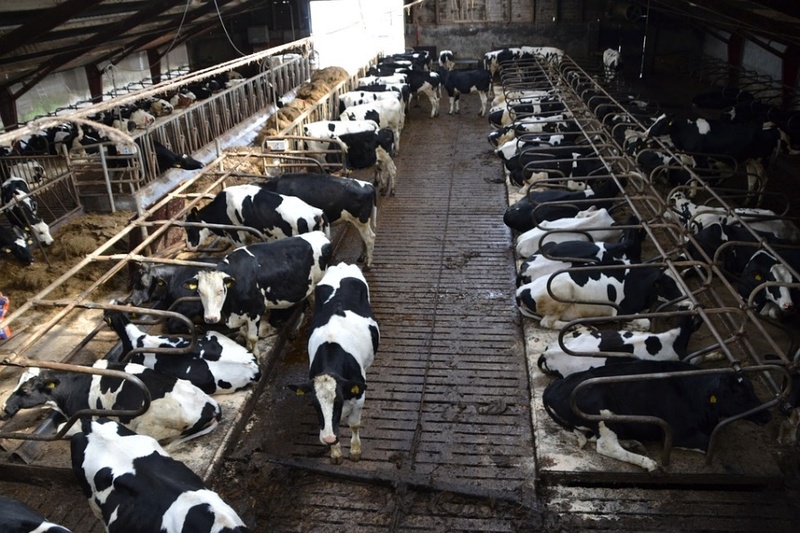 To get a better feel for cow comfort, let’s break this down by how the cow spends their day. High-producing cattle typically rest about 12-14 hours a day. The stocking density, or cow-to-stall ratio, should not exceed 120%, or 1.2 cows per stall in a free stall environment. For stanchion and tie stall barns, there should be 1 stall per cow. Pictured here is an example of a free stall pen. Resting areas should be clean and well-padded or bedded and alleyways should be clean and clear. There are many choices for bedding and they all have pros and cons. Sand is typically the best choice, but other options include saw dust, recycled manure, straw, and even peanut hulls. Doing research on the types of bedding you are interested in is critical to choosing what works best for you. Keeping a clean bed is also important as bedding tends to carry many germs and bacteria. Making sure these are cleaned and properly sanitized, either with barn lime or other products that are available, will help prevent diseases and mastitis. Alleyways should be wide enough for at least one cow to stand from one bed to the other, and have concrete with grooves for added traction. When a cow is standing in a stall with her two back feet in the alleyway, this is a sign of an uncomfortable bedding space. A good indicator of a comfy stall bed is to drop down on your knees in the bed. If your knees hurt, it’s probably uncomfortable for your cows as well, and could keep them from wanting to lay down. Beds should be short enough for the cow’s rear end to hang off the end, so the manure falls in the alleyway. If a bedding area isn’t properly cleaned and covered in manure and other fluids, a cow will not want to lay down. Cows need to chew their cud while laying down as this helps their rumen “buffer”. Cud is regurgitated food stuffs that weren’t broken down in the first compartments of the stomach and need further digestion. The rumen and the reticulum are the first two chambers of the stomach where solids and liquids are separated. The solid portions are then compressed into cud. When the cow is fed adequate amounts of effective fiber, this stimulates cud chewing. Chewing cud stimulates saliva production, which contains a natural antacid. Cows should produce 5-6 pounds of saliva per day for this to be effective. Proper buffering of the rumen has some advantages as it allows cows to digest forages better, which in turn allows them to eat more feed. Buffering also helps maintain normal butterfat tests, and prevent health problems such as lameness, displaced abomasum/twisted stomach, or ulcers. Heat stress can also cause discomfort for cows. To keep them comfortable (and support optimal milk production), sprinklers can be set up for when cows are feeding. Ideally, sprinklers should be run periodically on a cycle of 2 minutes on, 6 minutes off. Fans are also great for combating heat stress as well, as they help circulate the air and can run all day. Cows spend up to 6 hours a day eating. This means the feed bunk needs to be available to cattle for 20-22 hours per day. On average, a single cow requires 24-36 inches of feed bunk space. When new feed is fed, about 80% of the herd will eat. To continue encouragement of feeding, it’s always a good idea to fluff the feed every couple of hours or so. This keeps the feed fresh by replacing the top of the bunk with the bottom. 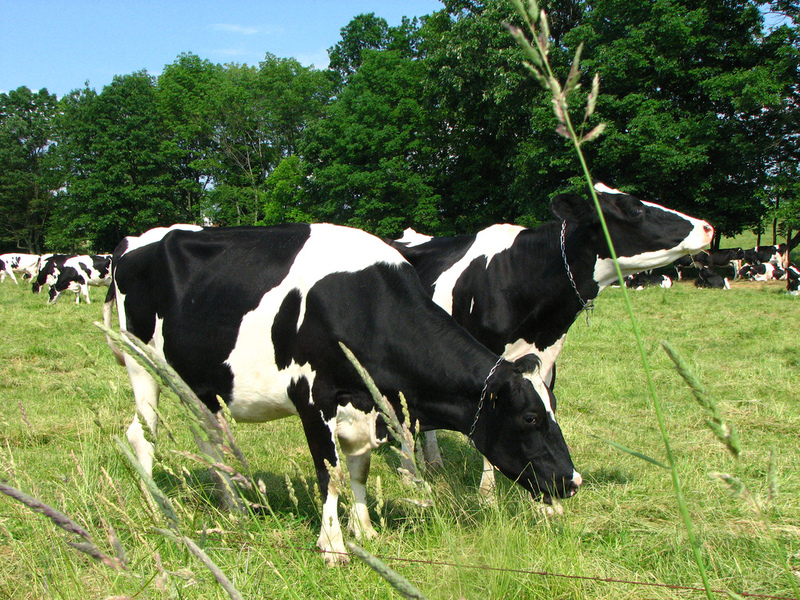 As for water intake, cows will drink 25-50 gallons of water per day, but only spend about 20 minutes drinking per day. This is because cows can drink at a rate of 1.2 gallons per minute. And since milk is 87% water, it makes sense for a dairy cow to consume so much water. 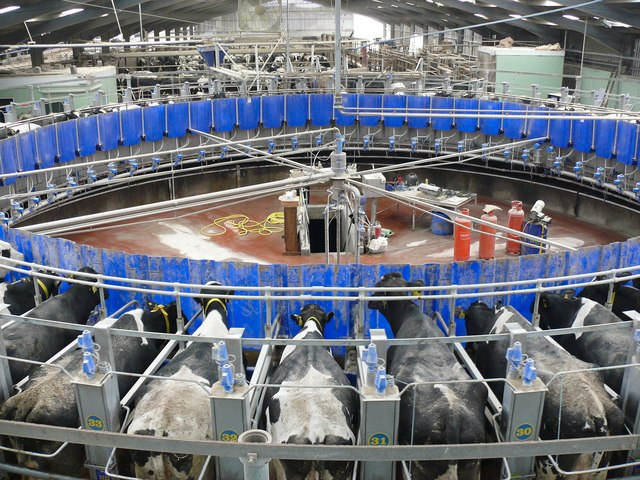 Water intake drives feed intake that fuels milk production. Placement and cleanliness of waterers is very important. Waterers should be placed close to the feed bunk as well as the return alleys from the milk parlor, without blocking the flow of movement. Last but not least, it is important to minimize the amount of time cows are left standing in the holding areas or waiting in the parlor. Cows should not spend more than 2.6 hours away from the pen. The longer the cows stand in the holding area and parlor, the less time they have to eat, drink, and rest. The best way to minimize this time is to break the herd up into smaller sections and/or more milking times. This would vary on your herd size and the size of your holding areas and parlor. Watching your cattle periodically will help you understand their personalities and daily activities more. This will also help you to understand who the boss cow is, who might not be getting the amount of feed needed, who is standing more than they should, and who might be sick. Lameness is a common factor in barns with poor cow comfort. Cows may not be getting enough nutrition to supplement their bones, joints, and hooves. If a cow is lame, this may deter her from getting up to go to the bunk or water trough, which will eventually lead to further nutritional deficiencies that negatively effect milk production. On your next herd health check, ask your vet for their opinions and they may have some tips to help improve your cow comfort. Now go put your cows in their jammies, read them a bed time story, and keep them comfy!